Servos, mounting brackets, extension cables, Y cables and reversers and parts to make working with servos easier. As well as the servo decoders on the Tam Valley Depot website, all of the servo products on this page work with all R/C servo controllers including Arduino and other brands of servo controllers (Adafruit, sparkfun, pololu and so forth). Subminiature 9g servo. These have plenty of power for hinged point turnouts and smaller rail (code 55 and smaller) solid point turnouts - if used with the servo mounting kit (SMK002 below) it can handle higher loads, up to code 100 non-hinged rail. If the point rails are hinged then the rail size is not an issue - it has been used up to G scale. 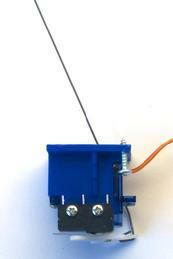 Our servo brackets (see below) are custom made to fit these servos. Size 1.25" wide (including mounting tabs) x 0.5" deep x 1.125" tall. Servo lead about 7". The label on the servo and the lead colors may vary between batches. Works with all of our boards. Every servo is tested before shipping. 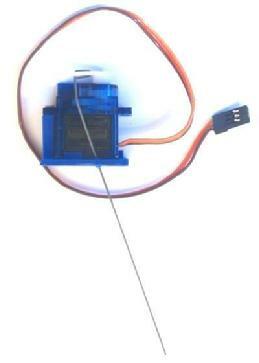 The Micro Switch Machine is a small servo-based switch machine with a built-in snap switch. It is 1.25 inches wide and 1.5 inches tall. It is ideal for N scale installations yet has enough torque to throw O scale turnouts. It comes completely assembled. Plugs in to servo driver board. No wires to strip or solder. Screw fits snugly in hole so it does not fall out when under the layout! Comes with foam tape and screws for mounting under the layout. The Micro Switch Machine is based on the SG90 servo with a 5 Amp rated snap switch mounted so that it is turned on and off at half throw - ideal for powering frogs. The wire actuator is already mounted for you. The Micro Switch Machine is ready to go. Comes with a piece of double-sided foam tape for ease of mounting as well as two #4x1/2" screws for permanent mounting. The #4 screws fit snugly in the mounting holes so that they will not fall out when you are under the layout :). 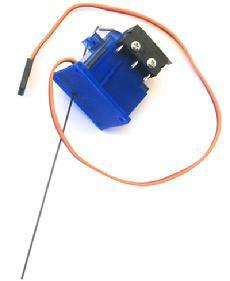 Use with any of your servo decoders to power a turnout and the contacts provide frog power. (See bracket specs below). 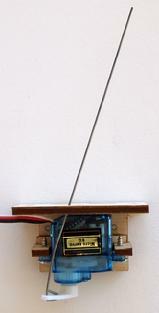 The Micro Switch Machine is based on the SG90 servo. This version does not have the snap switch mounted saving you money if you have another way to power the frog or you don't need powered frogs. The wire actuator is already mounted for you. The Micro Switch Machine is ready to go. Comes with a piece of double-sided foam tape for ease of mounting as well as 3 #4x1/2" screws for permanent mounting. 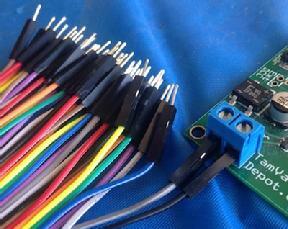 Use with any of your servo decoders to power a turnout. Also includes music wire, mounting tape and 2 screws. This bracket is designed to mount underneath the layout and actuate the points with a spring wire. 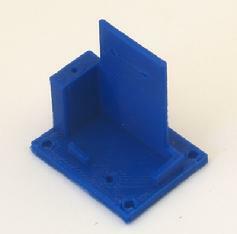 It is the same bracket as used in our Micro Switch Machine. However you are free to use this bracket in other creative ways if you feel the need to experiment. Comes with a piece of foam tape for easy attachment to the layout and two 1/2" x #4 screws for permanent attachment. A #4 screw fits snugly in the mounting holes so that when you are under the layout the screws will not fall in your face. Also comes with a piece of music wire. Fits servo size 0,87" (23mm) wide x .47" (12mm) deep (SG90, 9g servos). Minimum mounting clearance under layout - 1.5"
Note: May come packaged 2 per package to save space when you order several. These 2 images illustrate the amount throw available. Comes with everything pictured here. The SwitchWright is a newly designed servo bracket made out of laser-cut aircraft-grade plywood to make it rigid and durable. 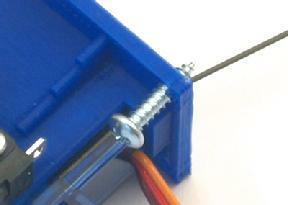 It holds the servo securely with two screws. The kit comes with everything you need - the mount, the wire, mounting screws for the servo and for mounting the bracket to the layout. We also include a piece of double-sided foam tape for holding the bracket in place until you can get the mounting screws in place. 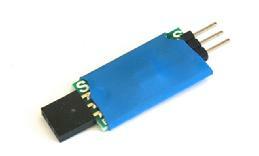 Fits servo size 0,87" (22mm) wide x .47" (12mm) deep (SG90, 9g servos). Minimum mounting clearance under layout - 1.375"
Material - 1/8" Birch Plywood laser cut by Monster Model Works. Just the laser-cut wood parts needed for a SwitchWright servo bracket. You supply the wire, foam tape, screws and servo as you desire. This is a nice way to mount servos for operating a semaphore blade. The kit works well for both miniature (SG90) and standard size servos. 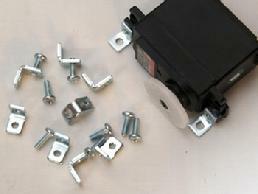 The kit includes (8) 3/8" L-brackets and (8) #4-40x1/4" screws for mounting four servos. Shown with the battery cover off. Servo plugs in to yellow board at right. Use an extension cable to extend the length of the cord. Use this handy portable tool to keep your servos centered while you mount them under the layout. 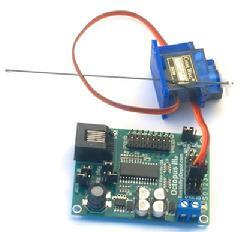 The tool consists of a battery box connected to a small circuit board that continuously puts out a centering signal for the servo (1.5 ms pulse). Keeping your servos porperly centered while mounting is the key to making the servos work best. The battery box has an on/off switch to save your batteries when not in use. Everyone using servos for turnouts needs one of these. Sometimes a servo will buzz or chatter continuously. Some poeple find this very annoying. 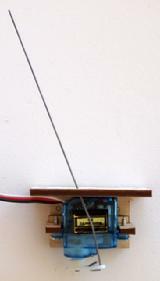 The No-Buzz goes in line with the servo cord and quiets the servo. Here is how it works - if the servo is stopped in the same position for more than about a second the circuit turns off the servo. If the servo starts moving again it will turn it on and drive the servo until it stops again. When the servo is stopped the gears will hold most switches in place. If you use the SwitchWright geometry then the wire acts as a over-the-center spring and also holds the points while the servo is off. A side benefit of the No-Buzz is that you do not need to adjust the servo as precisely but can overdrive the position and let the servo relax back after it turns off. Install the units as in the picture to the left. The white wires on both sides go to the side marked S (for signal - on some servos this wire is yellow). The right side with the pins go to the servo and the left side with the female plug goes to the board. 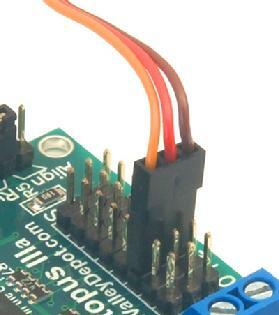 You can plug the unit directly in to the board or use a servo extension. These are used to put the servo farther away from the board. They daisy-chain together to form as long a cable as needed. How many of these can you daisy chain together? In an experiment I daisy-chained 15 extensions and found that the servo still worked OK. At 20 extensions, the servo threw but could not hold against back-pressure. So I would say up to 15 40cm extensions is the limit - that's 50 feet. They are also available from a number of sources including R/C stores. You can find some good deals on Ebay from suppliers in Taiwan. 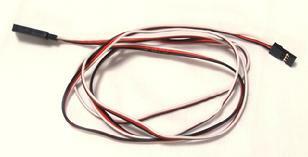 3-wire servo extension cable 12" (30cm) long, 24 AWG stranded wire. Added to the 12" cord that comes with most standard size servos you can power a switch up to 2 feet from an Octopus or Quad Servo board. Set of 10 cables. Can also be used for Fascia Controllers. 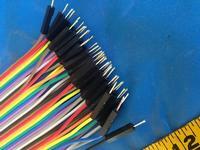 24 AWG 3-wire servo extension cable. Set of 10 40" extension cables. 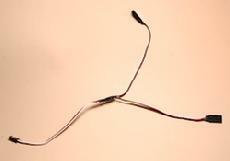 Y cables are used to attach two servos to one output. Both servos will move in the same manner at the same time. Could be used, for example, to control a crossover or a passing siding. Does not affect the servo power. 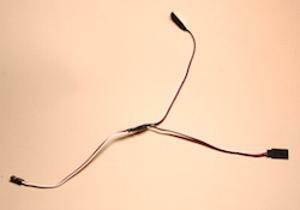 The Y can can also be used with the fascia controllers for the Quad-Pic to provide two control points for one switch. Use one for a pair of servos and one for a controller at the same time and you can set up a passing siding with control points at both ends! They are also available from a number of sources - R/C stores. You can find some good deals on Ebay from suppliers in Taiwan. The Female jumper wires connect to the gold pin 0.1" headers used on our boards. 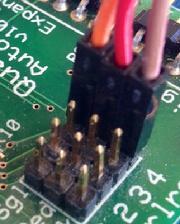 The Male pins fit nicely in to terminal blocks. Jumper wires to simplify connections to the boards. 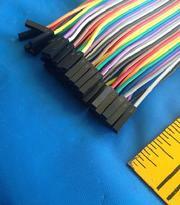 Pre-crimped and shrouded jumper wires in a ranbow of colors. The wires are easily seperated in to singles and bundles just by pulling. These handy wires have pre-crimped female connectors (F) that mate with the gold header pins used on many of our boards or male pins (M) that can fit in terminal blocks or act as extensions. They come with square plastic shrouds that prevent accididental shorts. You can get them in 3 varieties M-F, M-M and F-F. The M-F are particualarly nice because they plug in to one another to extend for a longer run. They come in rainbow colors with a repeating pattern of 10 colors. A total of 40 wires come together in a bundle. They are easily pulled apart so they can be used in groups or one at a time. At this price they are just 15 cents each. They are 30cm in length which just shy of 12". As above but both ends are Female (sockets). I often cut these in half to get 2 connectors that I can splice on to a longer wire. As above but both ends are Male (pins). I often cut these in half to get 2 connectors that I can splice on to a longer wire. Most of our boards come with enough jumpers for normal use. However, these little guys have a way of disappearing and so customers often need more so we are now offering this small 10-pack for your convenience. 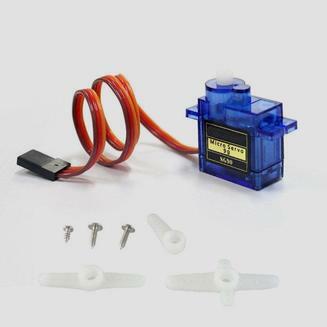 We recommend Hitec HS-311 servos as the best value for the money in a standard size. They are tough, powerful and inexpensive. We no longer carry them but there are several good sources of these on the web. A standard size servo might be better for an animation project. However, for turnouts, the miniatures plus mounting kit have plenty of power.